A bit of context is appropriate here. Every year in spring millions of trees all over the Former Soviet Union are painted white with a mixture of water, glue and lime (the mineral, not the fruit). Only the bottom meter or so is painted, giving the trees a typical ‘white skirt look’. This massive paint job usually takes place at the end of March or the beginning of April, right before Easter. Most of the work is done by community workers, but often ordinary citizens chip in on so-called ‘subbotniks’ or (semi-) voluntary community service days. The white skirts dominate parks, yards and boulevards from Lviv to Vladivostok, and from Murmansk to Tashkent. that it is just supposed to be this way. - finally, it’s supposed to repel or kill bugs (but why then is only the bottom meter or so painted and not the entire tree?). What can be said for certain is that trees in the West are not painted white and they seem to be doing fine, which makes you wonder: are millions of trees painted every year for absolutely no reason at all – just because it’s tradition? The answer is... yes. According to most gardening websites, ‘whitewashing’ or ‘lime washing’ is only useful for fruit trees. The lime protects vulnerable trees from rapid temperature fluctuations and is most effective when applied in autumn, before the frost kicks in. In hotter climates it may also protect leafless trees from the scorching spring sun. For this reason, trees are painted white in parts of Greece, Mexico and the USA. The Soviets came up with the tradition around WWII, originally as a way to discipline soldiers. After the war, it became an annual springtime event on the subbotnik calendar, just like snow shoveling in winter and leaf cleaning in autumn. At the time, asking questions or searching for logic would have been ill-advised. 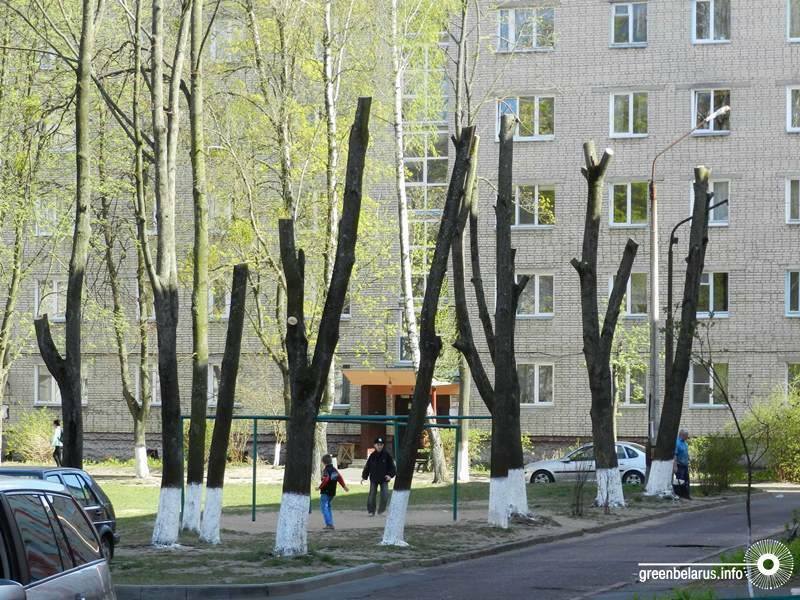 So, Soviet citizens soon got used to the habit and started to appreciate the clean white look of their tree trunks. Whitewashing became a massive neo-pagan ritual to mark the end of winter. Estonia, Latvia, Georgia and Azerbaijan. I’m not sure about Turkmenistan, because they don’t have Google Street View there. In Ukraine it is still common practice. But that might change soon, if other cities decide to follow Kyiv’s ban. "The springtime whitewashing only served to decorate the general grey- and dreariness of the Soviet system." In post-Maidan Ukraine, this is a highly political statement. Over the last few years the Ukrainian government has adopted a range of laws to cleanse the country of its Soviet past. All over Ukraine Lenin statues have been taken down and communist propaganda has been declared illegal. Many consider this ‘decommunization’ to be essential for Ukraine’s transition into a modern European nation. The municipality of Kyiv seems to be suggesting that the ban on painting trees white is a necessary step towards this bright future. But the decision has triggered resistance. After the announcement, Fishchuk’s Facebook wall was flooded with negative comments. Kyiv’s residents fervently defended the tradition, pointing out its undisputed benefits and, in many cases, praising its aesthetics. Who cares if it’s an old Soviet habit, they say. The white-skirted trees make the city look “merry” and “cosy”. A short stroll around the block shows Fishchuk’s decision is being ignored on a wide scale. In my street alone, about one out of three trees is sporting a crispy fresh white skirt. In other neighbourhoods, almost all trees have been painted white this spring, just like they have been for decades. Ban or no ban, Kyiv’s residents are taking to the streets with buckets of water, lime and glue – wilfully breaking the law and risking penalties. In a very much non-Soviet act of civil disobedience, they are holding on to their beloved Soviet tradition. We think of nature as full of color, brimming with life. We think of lush, green, hills, grass, trees, and perhaps the occasional white mountain top. Swedish photographer Hans Strand shows us that nature can be just as beautiful in black and white or duotone. He captures the nordic countries of Iceland, Denmark and his native Sweden in an incredible way.